Jacquie Maxted - Which of the Shipley Pits would have been referred to as ‘Waterloo Pit'? Michelle Marriott - Shipley Pit Bottom, what is a ‘Rammel Fan’? Which of the Shipley Pits would have been referred to as Waterloo Pit'? I was wondering if you might be able to help me to solve a question I have or may know of a source of information which could help me. I have read lots of information from your web site and noted some references to the waterloo seam and pit I have looked at other information on the internet but despite some 'clues' I cannot find much out. I would like to know which of the Shipley pits would have been referred to as ‘Waterloo Pit'. My Great Grandfather, Thomas Olney worked there. I know that he was a colliery engine winder for many years at Shipley, certainly 1881 - 1911 as confirmed by census. At his death in 1926 at the age of 67, his profession is still named as colliery winding engineman. Therefore he may still have been working up to becoming ill. I realise he could have worked at more than one of the headstocks but would dearly love to know. I would like to share the photograph with you from which I have the information. A later comment identifies Great Grandad Olney as the Man in the middle with the impressive moustache. You will see that there is lots of detail on it to help date it. 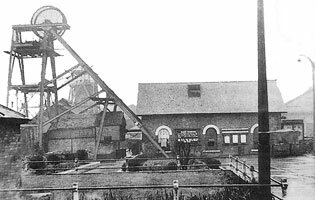 The building and headstocks look very similar in date to the photograph of the Peacock colliery in Cotmanhay and also one I have seen of Loscoe Pit. I do hope you enjoy it and can perhaps share any further thoughts you have. My Great Grandad's name was Thomas Olney. He was born in Marylebone London and became an orphan. In 1871 he was living in St Marylebone Workhouse Schools and by 1880 he was living in Cotmanhay, Derbyshire where he married. His job was recorded as engine man at that time. Some years ago I was told that he was the colliery winder and the photograph and census from 1881 -1911 confirm this. I was also told that he worked on Kings Cross Station. He may also have worked on St Pancras and one suggestion is that he came here because of the Butterley Company but that is not confirmed. I like to think that he did a good job of winding the miners up and down safely for all those years as he would have been the last person they saw before they went down to such a tough working environment and the person they saw when they came back up at the end of their shift. Another interesting point is that he died of cancer of the oesophagus which may have been influenced by occupational factors. Waterloo was a seam of coal and many coal mines dug down to it including Bolsover, Hucknal, Moorgreen, Pleasley, Wollaton Grange, Shirebrook but possibly your best bet would be Coppice No2, Shipley, Waterloo, (owned by Shipley Collieries Ltd) closed 1929. Shipley Pit Bottom, what is a ‘Rammel Fan’? I am a ranger at Shipley Country Park, Heanor, Derbyshire and I am currently working on a Heritage Information to highlight the mining history of the park. I discovered a picture on your site of Shipley pit bottom and I would like to use this in the panel – I am therefore emailing you to request your permission to do so. Also, I have found out that the first 'Rammel Fan' to be used in Great Britain was erected on the Shipley Estate. Do you know what a 'Rammel Fan' is? I'm guessing it is some kind of mechanical ventilator for underground mining but would appreciate any information you have on this type of fan. Many thanks for your help with the above. As far as I'm aware a Rammel Fan was a type of centrifugal ventilation fan for deep mines introduced from the 1860s onwards. The purpose would be the exhausting of mine gases and temperature control within the workings. At Shipley this would have been steam driven, and surface mounted. There doesn't seem to be much documented on the Rammel design; well known types are Guibal, Waddle, Schiele, Walker, Capell and Sirocco. Perhaps the Rammel was problematic in some way, noting that "rammel" is a term for rubbish or waste within some mining/former mining communities. It would appear that the Rammel fan could assume huge dimensions (depending on the target air movement value), with the 1897 inventory of Bettisfield Colliery (North Wales) listing one with a diameter of 82 feet. Centrifugal fans took over from fire ventilation (e.g. the Nutbrook Colliery Cupola), air pumps and various other less efficient/more dangerous methods. A couple of sites which may be of use to the Ranger Michelle Marriott and to Wendy White, (above) also anyone else who is interested. 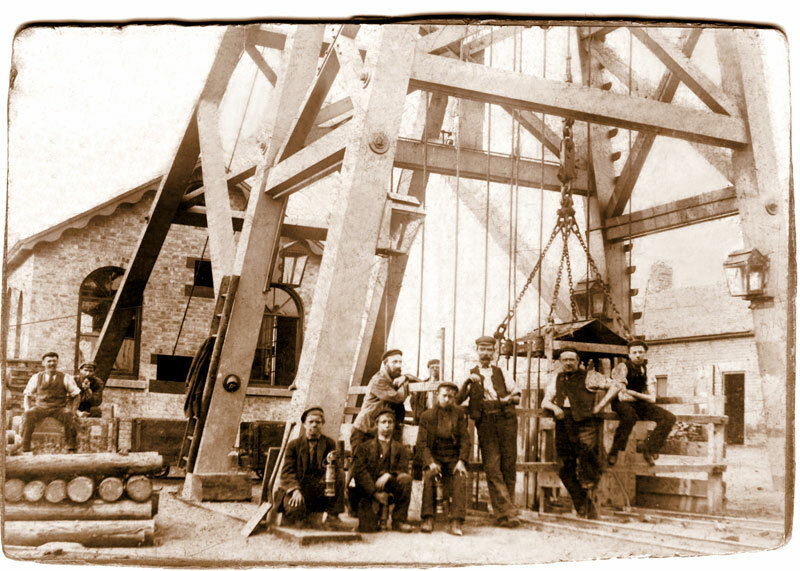 Have a look at Heanor History Society, this has a section on local collieries for starters. Scroll down to the bottom of the home page and there is a link to the society’s forum with a section devoted to mining. The absolute cracker is Internet Archive, hope that I have it correct. This is a US based site which holds downloadable archives in various formats including books in pdf format. Mine ventilation, coal, coal mining and blasting used in the search facility produce good results. There are several copies available of the transactions of The North of England Mining and etc Society (correct title has departed the two brain cells for the time being), to find these use the word transactions in the search facility. Please be aware that US coal mining textbooks can contain working practices and techniques that would not have been used in UK coalmines. I have only downloaded publications that have been published by UK sources. The second site is best visited before early afternoon; North America starts to go online at about that time. This makes the site quite sluggish in response to searches and downloads. I have had a look for Rammell fan in my collection of books. No trace unfortunately but someone will have the information. The local papers may hold a few more clues, might be worth looking at planning permission or similar records. Order date 12-08-1908 Order Number 8880 Engine Number 14873 Engine specification twin compound, 140 rev/min, 150 bhp, 11 1/4ins (hp bore) 18 1/2ins (lp bore) by 20 ins stroke Built by Davidson and Co Siroco Works Belfast for Shipley Colliery Direct coupled to colliery ventilation fan Date sent 10-03-1909 Dwg ref 2009/2A The engine was a Paxman Lentz design which was one of the most economical designs for its power output in terms of steam consumption and running costs. The engine maker works name, Siroco, is used to describe a type of ventilation fan for colliery use. It may be that Rammell was responsible for erecting and commissioning the fan and engine hence Rammell being used in the description. Hope the above is of use, Apologies for the late response but a slight medical problem has kept me away from the PC for most of 2007 so I am slowly putting my two penn'orths in to my interests. Dear Fionn, Saw your excellent Web site. Reference the steam engines employed at Woodside Colliery, the information on the main engine is correct, ( Paxman - Lentz ) but it wasn’t directly connected to the 15' fan, but coupled by about 8X 2"dia. rope belts. This was prior to the electric motor (500 HP) being installed. The problem with the steam engines was the consumption of steam. The engine, when it ran was a delight to be seen and smooth in operation. Regards the other steam fan, it was a "Waddle" fan, approx. 20' dia. Single cylinder, again ran sweetly. That was only kept for emergency use. Unfortunately these engines were never coupled into the low pressure system that we had at Woodside, the waste steam went straight into the atmosphere. Had they been coupled into the system the (LP) steam could have been used again fed into the British and Thompson Turbine/ Alternator generating plant. (3300volt-1000 KVA, 3000 RPM). I worked in that Power House for many years and we also had to keep check on the fans , every hour. Hope this will help. Sadly, perhaps both scrapped?? There is a reference (from a Ranger at what is now Shipley Country Park, see above) which speaks of a picture of Shipley Coppice Bottom. I did a search of the website but couldn't locate it - could you help? I have a special interest in that my Grandfather Jesse Harrison died as a result of being injured by a fall of rock in Shipley Coppice pit and was buried on what would have been his 42nd Birthday in 1928. Do hope you're able to help - great site by the way!